My husband and I are huge lovers of music! He is a musician at heart so naturally I hoped that one day our children would also be musically inclined. After Grey was born, it didn’t take long for us to realize that he, too, also had a love and passion for music, which led him to start writing and recording songs with his daddy. Turn on a song and he’ll show you how to bust a move! Hand him a mic, and he’ll sing his little heart out! 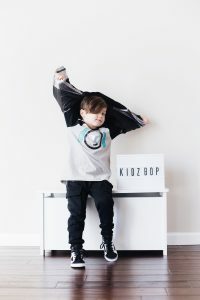 When we heard that children’s retailer Crazy 8 had teamed up with #1 children’s music brand, KIDZ BOP, we were excited to collaborate with them on sharing the new line with all of you! 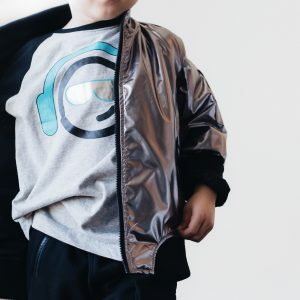 The limited edition Capsule Collection features some of the hippest trends for your kids! From comfy joggers, to faux fur, to high top shoes, they’ve got you covered! 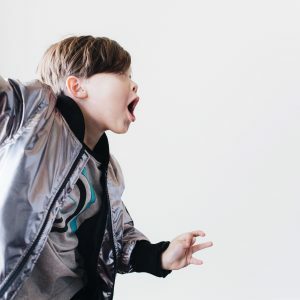 If your littles are looking for even more fun ways to live like a pop star, they can enter the “Rock the Party” sweepstakes by 12/8/2016 where they have the opportunity to win pieces from the collection, KIDZ BOP swag, and even more! Shop Grey’s look here and let us know in the comments below what your favorite piece is from the collection. I love that Jacket on Greyson. So cute!! My Emmy girl would go nuts over the faux fur bomber!! I love that shirt and jacket! Carson would LOVE the Headphones Tee! I love their shirts because they don’t strink up on my long torso little guy! That bomber jacket is my favorite piece! I want to get Mila that black Faux Fur jacket! Soooo cute! And that metallic jacket looks so good on Grey! The bomber jackets and the high top sneakers are our fav pieces! Oh my goodness so cute. Marlo would love that silver jacket. Such cute clothes. Love the sequins lightning bolt shirt and plaid pants! My girl, Zoe, would love rocking it! favorites are the slouch beanie, high tops and cargo joggers! The high top sneakers and faux fur vest are too cute. Omg this collection is so cute!!! I love the checked blazer. 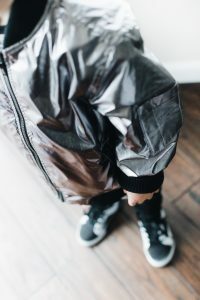 I can’t decide between the metallic bomber jacket or the high tops, but I am leaning heavily towards the jacket!